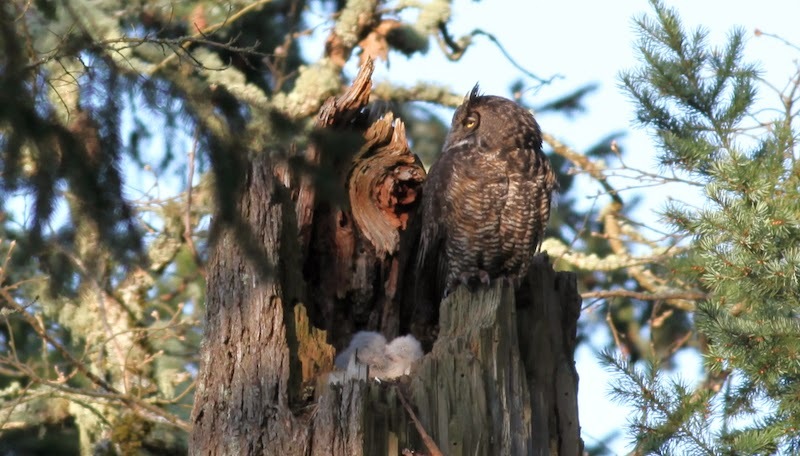 Good Stuff NW: Ayers Creek Owl Update: Release! Anthony Boutard of Ayers Creek Farm is keeping me updated on the Great Horned Owl nest in the top of a snag near their house. And yes, that little lump of grey just below her to the left are the two owlets! After 51 days on the nest, the mother took a moment to enjoy the morning's sunshine. The first time we have seen her off the nest since that afternoon on the first of February when she sat down and laid her first egg.